Totally satisfying and delicious, Skinny Frappes are awesome. Just blend with skim milk and ice, or go crazy by adding your favorite flavored sugar free syrups or espresso. 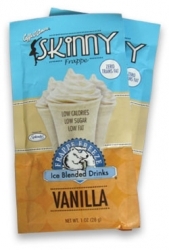 Click to order your Skinny Frappe Vanilla.